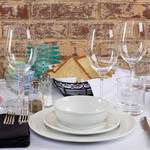 Add noticeable style to any place setting with this Carlisle Foodservice 4300414 Ocean Blue Dinner Plate. With a 9 inch diameter and made of heavyweight melamine the Carlisle Foodservice 4300414 Ocean Blue Dinner Plate has all the classic look and feel of china without the cost. Featuring a slick water-sheeting glaze surface with a mirror finish the Carlisle Foodservice 4300414 Ocean Blue Dinner Plate is resistant to scratching and staining. Great for any full service restaurant from fine dining to casual or for catering events large and small always present a beautiful table top with the Carlisle Foodservice 4300414 Ocean Blue Dinner Plate.